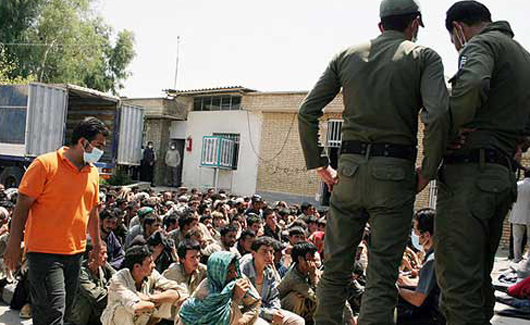 Human Rights Watch says the Islamic Republic is dispatching Afghan immigrants to fight in the Syrian conflict. In a report issued on Friday January 29, Human Rights Watch states that it has interviewed 30 Afghans involved in the Syrian war, and they told the group they were forced to join the battle under threat of deportation from Iran. Members of Iran’s Revolutionary Guards, Basij organization and Afghan immigrants are among the Iranians being dispatched to Syria as “defenders of the Shrine of Zeynab”, a Shia saint whose tomb is just outside Damascus. Human Rights Watch alleges that some of the Afghans being sent to fight are under the age of 18. Human Rights Watch reports that about three million Afghans live in Iran and only 950 thousand of those are documented. The Islamic Republic does not deny that Afghan immigrants are being sent to fight in the Syrian war and in some cases it has held special funerals for those who have died in Syria. However, it maintains that the Afghan immigrants going to Syria are volunteers.